After visiting Badavi Linga idol, we headed towards Royal Enclosure. On the Royal Enclosure side of Hampi, the first attraction you will get to see is Queen’s bath. This is the place where queen used to take bath. However, many theories decline this and suggest that it is a place used for recreational activities. Whatever be the case, it is a beautiful structure one cannot miss. It has an empty pond in the middle and a beautiful open pavilion with small windows. There are steps on one side through which one can get to the pond area. We spent time there till 5 PM and headed further towards the Royal Enclosure area. The first structure you get to see in the Royal Enclosure is the huge Mahanavami Dibba. Mahanavami Dibba is a large stone platform built by Krishna Devaraya of Vijayanagara dynasty to celebrate his victory over Udayagiri. The structure is more beautiful than you see in the photos. When I Had a look at the photo of this place before visiting, I did not find it interesting at all, but the reality is quite different. You need to climb about 25-30 big steps to reach the top. The side walls of the platform have a well-carved array of sculptures. At the top, there is nothing except a big plain stage. This is from where kings used to watch the march past of the army, cultural celebrations during Dusshera, sword fights, and other cultural activities. Now, if you go on top and have a look, you can find the ruins of the Royal Enclosure. Though it is sad to see the renowned town in such condition, never miss to sit there for some time and imagine the glorious past of the place. At the backside of the platform also, there are steps to climb. You can climb up from the front steps and climb down using the rear steps to cover the structure completely. From Mahanavami Dibba, we walked towards the stepped tank which is in the same enclosure. 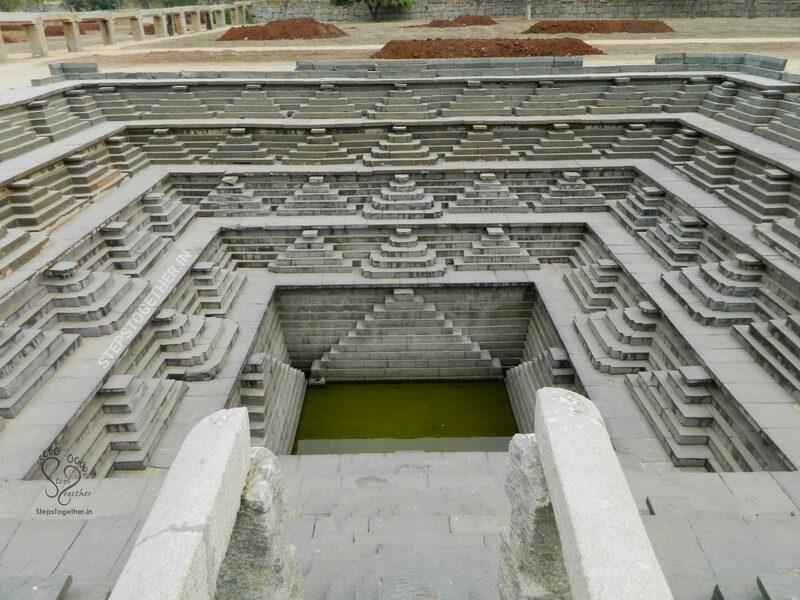 This stepped tank was excavated in the 1980’s and is one of the beautiful water tanks. Well maintained by the ASI, the tank has steps in the formation of pyramids next to each other making it look elegant. The water of this tank was believed to be used for religious purposes. Next to this tank is the public tank. This is bigger and normal looking tank. There is no water in the public tank currently. Apart from these, there is a king’s audience hall in this royal enclosure. Note: When we were near the stepped tank, the security guard asked us to show the entry ticket. There was no facility to get the entry ticket in the royal enclosure. He informed us that we need to buy the ticket in Vittala temple which would be applicable for all the monuments. When we told him that we had not yet visited Vittala temple and we came from a different route, he did not insist us. We left from Royal enclosure at 5.50 PM and headed towards our hotel Gowri Resort which is on the other side of Tungabhadra river and since we went in the car, we had to take the longer route via Bukkasagara. In a few stretches, the road was not good and it made us reach the resort at 6.45 PM. Very nice read to your blog which is related to Queen’s Bath tank I am really thankful to have the information from this post. Thanks for sharing this post with us. The architecture of of the stepped tank is truly marvelous. Wow! Such places are so intriguing! Yes. Very true. Thanks for stopping by. Loved the stepped well! I wonder when I get to visit Hampi! Thanks Mridula. Do visit Hampi. You will fall in love with it.